This chic cardigan just added the perfect amount of cuteness, don't you think? The pink hue adds a soft element to this look while the shaggy tassels, mixed knit and subtle beams add a dynamic detail to the entire outfit! I normally pair it with skinny jeans, but I decided to style this on the blog with a pair of flared jeans I recently picked up. Affordable and super comfy! Can you now talk about how adorable my son is? This was shot behind my work. My husband came to pick me up after work with my son and while I was shooting, he wanted in on the picture. I think I may have a future blogger on my hands. Either way, I love this little man! Totally in love with that bag!! Gorgeous jacket - I love the color and texture! Love the textured fringe on the jacket - it's perfect! Love your fun and pretty cardigan! Great location for a photo shoot! Great look! The cardi looks so cozy. Love the bag too! Cute outfit! i love that sweater! Lovely all flared look Crissy! Your son is adorable! Love your cardigan and your bag!! This sweater looks both warm and fun. The shag sweater is making a come back and I think I like it! Thank for linking up with us on Start the Week Stylish! I am obsessed with this jacket, not only is it so fun but it also looks super cozy! 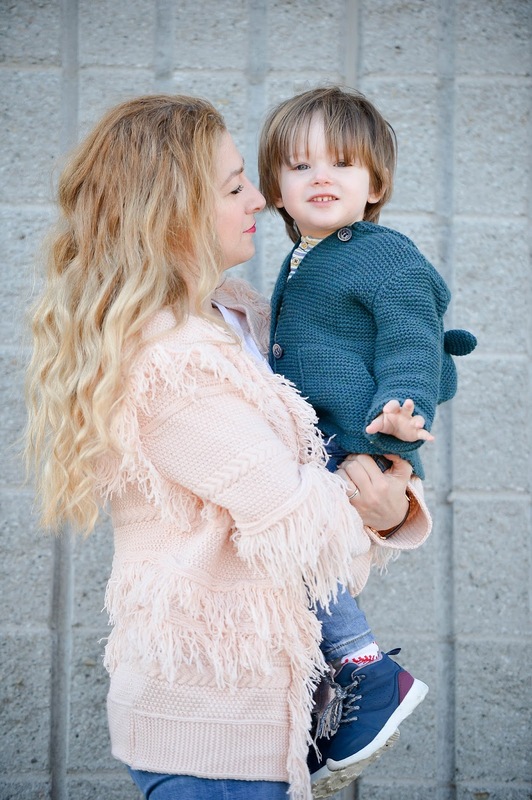 What a fun cardigan and how can you say no to a cutie pie that wants to have his picture taken. This sweater is gorgeous and the color is perfect for you!